If you are planning to travel around Sussex today, here is the latest travel information. In Chichester, the A286 Orchard Street is showing long queues of traffic with delays expected in the area. Stockbridge Road, close to the railway station, is also showing signs of delays. There are also reports of slow traffic close to the Findon roundabout. In Worthing, there are usual delays approaching the Grove Lodge roundabout from the A24. In East Sussex, traffic reports are showing delays on the A27 close to Lewes and Falmer and on the A259 there are reports of delays eastbound just before Little Common. 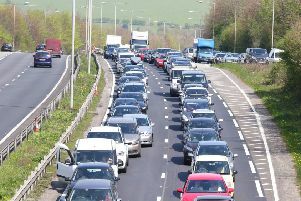 There are also reports of long delays on the A2270 Eastbourne Road from the A27 to Coopers Hill. On the trains, the Great Western Railway service between Reading and Gatwick Airport and the Southern services between Reigate and London Victoria, Thameslink services between Bedford and Brighton/Gatwick Airport/Three Bridges and also between Peterborough and Horsham Gatwick Express between London Victoria and Gatwick Airport/Brighton have been affected by planned engineering work. The work is taking place between Purley and Redhill/Gatwick Airport/Reigate, closing lines at various locations and at various times over the weekend. If you spot any problems on the roads or the trains, please contact stephen.wynn-davies@jpimedia.co.uk.